To make the labneh, line a colander or sieve with a double layer of cheesecloth or muslin and place over a bowl small enough to fit in your fridge. Pour in the yogurt and add ½ tsp salt. Wrap the cloth around it and tie into a bunch, then leave to strain, preferably overnight, until much thicker, but still creamy. Put the chicken thighs in a large food bag or bowl and season well. Whisk the lemon juice and oil together then add the garlic, spices and bay leaves. Mix thoroughly and pour over the chicken, rubbing in using your hands. If you prefer to keep your hands clean and you are using a bag, seal it first, then massage from the outside. Leave to marinade in the fridge, covered for at least 2 hours, but preferably overnight. Allow the chicken to come to room temperature before cooking. To cook the chicken, heat a grill or griddle pan and scrape off any excess marinade from the chicken. Over a medium heat, grill or griddle the chicken, turning frequently, for around 20-25 minutes, or until cooked through. 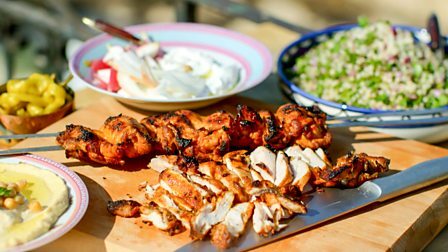 Remove from the barbecue and leave to rest for a few minutes, before slicing up and serving with the labneh.